Pool Tek of the Palm Beaches is a family owned and operated business that was started in 2005. 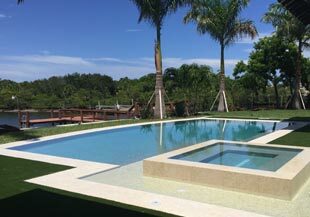 We wanted to be the Pool Builder that could overcome the stereotypes of pool contracting in South Florida. With hard work and dedication we have proven to be a reputable and honest pool builder, and earn the respect of the community they served. The Pool Tek staff is not only focused on teamwork, but on building an environment where everyone feels like family. From the employees to the families we serve, we truly only work with the best in the business. We pride ourselves on handling every detail of pool contracting from the initial design phase to the finishing touches. Our goal is to give that little bit of extra into every job that we take on, believing that it's that personal touch that allows us to consistently surpass our clients' expectations and stand out from the rest. We are not only dedicated to our own pools, but also to finishing jobs that other pool companies bail out on and following up to create projects that others simply could not. We get to know our customers on a first name basis, and work diligently to be sure that our customers can actually speak with an owner at any time, for any reason. We hold daily staff meetings to discuss the day's events and weekly follow-ups on all major projects with our highly motivated and professional team. Frank has established an outstanding reputation within the industry with his easy going personality and his vast knowledge of all things pools. Mention his name to anyone within the Palm Beach pool business and they will have something great to say about Frank! With over 25 years of experience, clients and businesses alike have come to rely on his expertise and value his professional opinion. Frank resides with his wife, Audrey and their four children in West Palm Beach. He enjoys spending time with his family and can frequently be found at his children's' numerous sporting events throughout Palm Beach County. Lisa has worked as the office manager of Pool Tek of the Palm Beaches since 2005. She had become an integral part of the day to day relationships with their clients helping them throughout their pool projects. In 2015, her brother, Frank Juliano, asked her to become partners with him in Pool Tek of the Palm Beaches. Together they will continue to provide quality service to their clients. "Thanks again for my beautiful pool and patio! I appreciate your attention to details and for making it easy to manage from out of state. I'll really enjoy it. Best wishes for the new year." My family is SO pleased with our pool you completed for us this year. Actually the entire backyard had been transformed into an oasis for us. I cannot state strongly enough how much we appreciate the work you and your crews did to make this transformation happen. From the very first meeting to discuss the initial "wish" list and design, we were made to feel that our dreams were your dreams for us as well. Through every step of the process our comfort levels were always foremost in your minds. You and your crews always checked to see how we thought and felt about the design, process, material and timing of the entire project. To Frank and Lisa; Thank you for making it seem so easy for us to add a pool to our back yard. I don't think we could have chosen anyone better to take care of us. I feel as as if I am not stressing enough how please we are with our new pool! I can only say "thank you so very much Pool Tek! “After hearing for several years here in Florida about the pitfalls of hiring the wrong pool contractor, we interviewed six potential companies before deciding on Pool Tek. We were pleasantly surprised at the speed of the tile installation and resurfacing processes, as well as the professional attitude of the Pool Tek personnel. Pool Tek will handle every detail of your pool or spa project from the initial design to the final touches.